Instead of killing time why not be productive by applying in BPO companies that have setup recruitment hubs inside the malls. That’s the awesome tip that we have learned from Facebook user Enzo Bautista. It's like killing two birds in one stone, you could have a free meal and at the same time you would be helping head hunters achieve their numbers. Kudos to these companies that provide free meals because, they know how to appreciate the time and effort of their applicants. 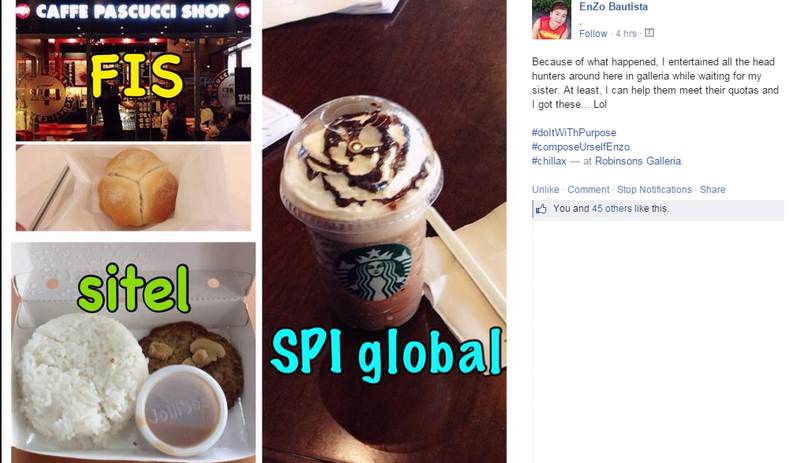 I would like to try these sometime and see if I could also hit the jackpot just like Enzo wherein he got a full meal plus a Starbucks coffee. Based on my experience you can also get free items by joining job caravans and company open house events. Some companies would provide a raffle entry for cellphone or other gadgets like USB Flash drive or Go Pro cameras. Of course there are terms and conditions that needs to be checked before you qualify to get the items, better check it with the HR person of the company. So, which freebie do you prefer?